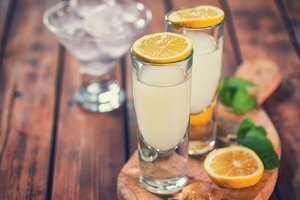 Many classic vodka mixed drinks involve a tart citrus note, from the slice of lime in a vodka and tonic to the healthy dose of lemon juice in a vodka Collins. It's no surprise, then, that vodka and lemonade go together beautifully, creating a cool, refreshing tall drink that's perfect for warm summer evenings. The basic formula for vodka and lemonade is simple. Mix a batch of lemonade, pour vodka over ice into a tall glass and add the lemonade to taste. The exact ratio of lemonade to vodka will vary — recipes recommend anything from 2 to 1 as high as 4 to 1. Experiment to find the perfect mixture for you, adding lemonade gradually until you're happy with the result. Garnish your drink with a wedge of lemon or a strip of lemon peel. If you're not in North America, be sure to specify clearly the drink you're looking for when buying ingredients. In Britain, for instance, "lemonade" can mean a fizzy, citrus-flavored soft drink. You can customize your vodka and lemonade mixture by adding a range of other ingredients. Fresh raspberries will give your drink more fruit flavor, or try a splash of black currant liqueur or cordial. For a cooling addition, add mint leaves to the mix or just garnish with mint. For a more concentrated short drink, skip the water altogether and simply make your lemonade from vodka, sugar and lemon juice. To do that, just mix 2/3 cup of sugar, a cup of lemon juice and 1.5 cups of vodka, then serve over ice. Be warned: This is a much more potent mixture, not the tall summer cooler you'll create when mixing vodka and lemonade. Vodka and lemonade is best when made with fresh lemonade, but frozen lemonade concentrate plays a part in an unusual beer cocktail, the porch crawler. To make this unusual mixed drink, stir together half a shot of vodka, 3 ounces of frozen lemonade concentrate and 6 ounces of lager. Serve the mixture over ice for a refreshing citrus brew with a hidden kick.